I sometimes get emails from friends searching for ideas of things to do with their kids. Help! We're bored! Who hasn't experienced this? The Man-child used to get fussy before he could vocalize that he was bored and needed something to do. My go-to activities are playing outside or a trip to the grocery store. Just going outside is usually enough, but even there I occasionally hear, "What can I do?" I try to involve him in whatever I do in the garden, but after dropping three or so beans in holes, he is done. There are several books on Amazon that I've been crooning over as sources for gardening ideas, but haven't yet purchased them. I suppose if I were a good Greenie, I'd visit the library, but I know my boys. Just yesterday I found the Baby literally consuming the Word of God. 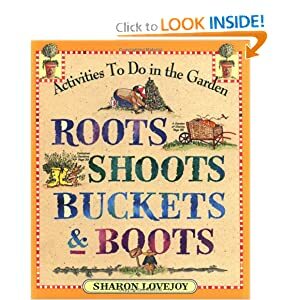 There are so many good reviews on Amazon about Roots Shoots Buckets & Boots by Sharon Lovejoy. 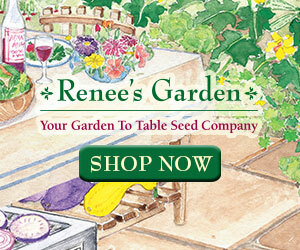 She has several gardening books, one which is subtitled "A Book for Children and their Grown-ups". Apparently, she knows what's up. My kids are probably still young for this book, but I love the idea of emphasizing green gardening for them. The book also has year-round projects for both indoors and outdoors and comes with "Super Sprouters" seeds. I've read many stories lately about children going to school hungry and going home hungry on the weekends and communities that are trying to help end childhood hunger. What if there were are garden on the school grounds where kids could grow their own food? How to Grow a School Garden is high on my list, and I hope that sometime soon I am able to give back to my community in this way. Here's three more. I'm not a Grandma, but Toad Cottages & Shooting Stars and would make a great book for either a grandma or the seasoned lady inside each of us! Do you have a go-to idea book or blog? I'd love to know! Ohhh these all look so good! And I love your idea about a school garden! How awesome would that be??? 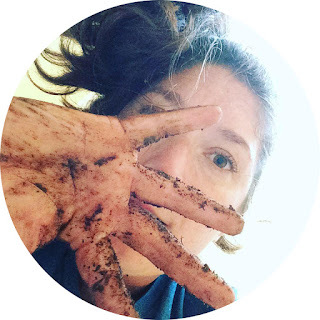 i reviewed a new one on my blog recently that you might like -- project garden by stacy tornio. there are lots of good kid-friendly activities in there.